Is this legit? Seller also says all of the tracks are on one side instead of A/B sides. 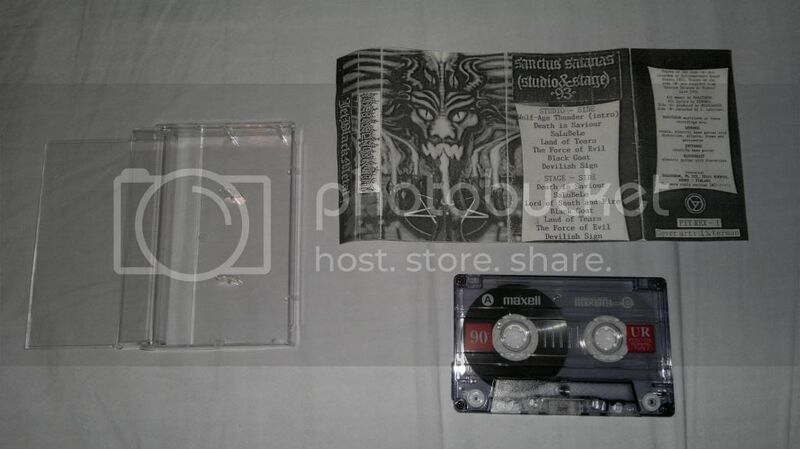 Yes, "Sanctus Satanas" is on white hand numbered tape. There should be this silver logo-sticker too. "Studio-side" and "Stage-side" is how the program goes. And that cover shown above looks too pale compared to the real jacket of this JetBlackMetal-masterpiece. My Nachtmystium tape looks the same. Only that my tape is TDK. I suppose Sombre used whatever he had to make copies. Mine also looks like that and I'm quite sure it's also original.. Think those might be original: Algol/Cremation/Tumulus (both sided xeroxed)/Irreverent. Rotting christ has a bunch of livetracks added ("Live in Athens"). "Satanas Tedeum" was originally released with a pro-printed, glossy three-paneled j-card whereas, based on your picture, it looks like you only have a xeroxed j-card with two panels there. Still, sounds cool with the extra live tracks dubbed on the tape. "Wrath of the Tyrant" isn't a copy as sold by the band. It was hand-numbered afer all. All copies of "Realm of the Dark" were dubbed on white studio tapes as far as I know and the j-card has to look much more defined and way higher in contrast. I'd say that's a bootleg as well. Mmmh, I've had several copies of both Algol tapes over the years, and all came with white stickers and typed band name, title etc on them. That "Medieval Prophecy" tape looks legit to me. Say, what's mentioned on the sticker, "Into the Pentagram" and "The Third of the Storm", both typed in cap? 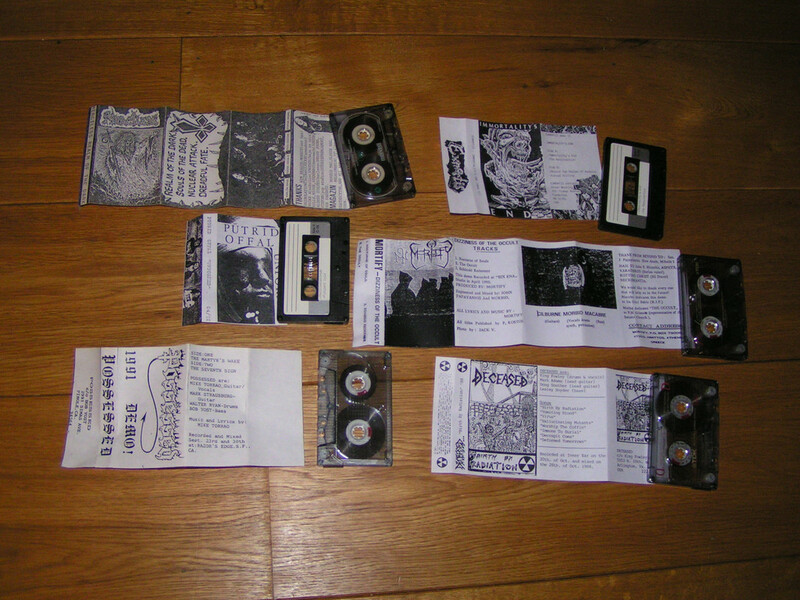 Btw, Jelle, what's the Samael tape in the first picture? Merciless should be a white tape without any print. Was already pretty sure Merciless was a bootleg (I know people kept this 'in print' for a very long time), thanks for confirming. That second tape, not sure what it is. A-side has Medieval prophecy with different running order. B-side has Morbid metal, Knowledge of ancient kingdom & the dark. So basically it's recordings '88-'89 with one extra track. I'm sitting here thinking, I know a lot of these tapes originate from San (Bestial summoning/Wimp records). 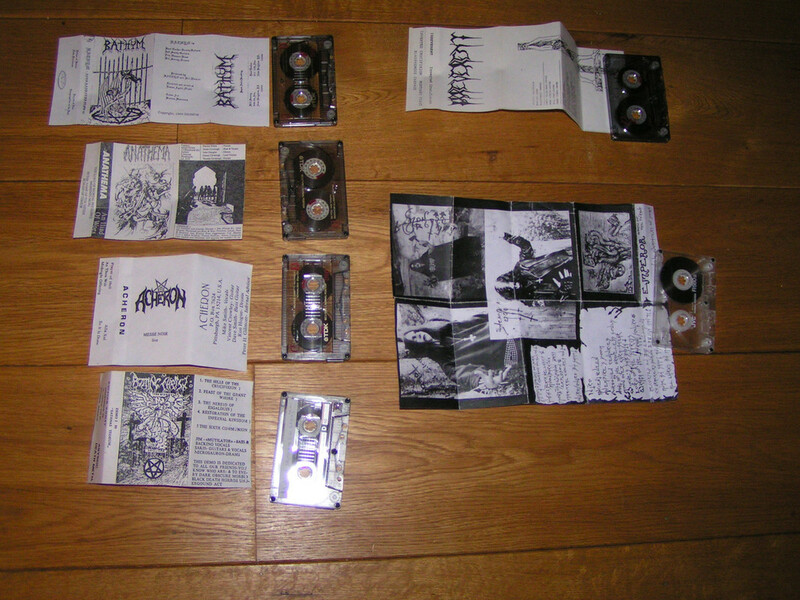 San also made a 'compilation' of Darkthrone demo's which he sold through Wimp records. Maybe this is also something San made and sold himself? Deceased "Birth By Radiation" cover should be yellow. Exmortis "Immortality's End" cover should be red. Rotting Christ "Satanas Teduem" should have a glossy cover and hand numbered. Paradise Lost 'Frozen Illusion" should have a greenish cover w/ print on both sides of cover. Damnatory cover should have print on both sides, otherwise it could be the original version, as I got my copy from the band and it was dubbed on a regular cassette also. Disgrace demo had a glossy cover and a white, factory made cassette. Rotting Christ "satanas tedeum" is not glossy but thick paper/ carton! Maybe there where made various versions but the one i had from 1991 had a very thick carton / paper and should be slightly yellow by now. I think 90% of the tape-bunch are boots. Tumulus has a different tape, Emperor also (though i guess they used whatever possible...?). The copy that I got from Jim Mutilator was hand numbered with a pen. It also had a glossy cover. I no longer have the demo. The tape should be white without bodyprint or sticker.